Coinciding with the fiftieth anniversary of the group’s historical first recording for EMI, the CD features fellow Miami transplants and Grammy Award winners, violinist Federico Britos and saxophonist Ed Calle, as well as Cuban classical and jazz guitarist Enrique Gardano, and Peruvian percussionists Alfredo Valiente & Cesar Ballumbrosio. 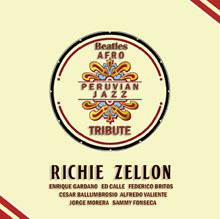 In addition to the 9 selections authored by Lennon, McCartney and Harrison, the CD includes “Serenata en Lando”, a piece written by Zellon in memory of his mentor, the late renowned Afro-peruvian guitarist and composer Felix Casaverde, who in 1981 accompanied him on his first recording (“Landologia”). This CD is also available for download from I Tunes and Amazon.